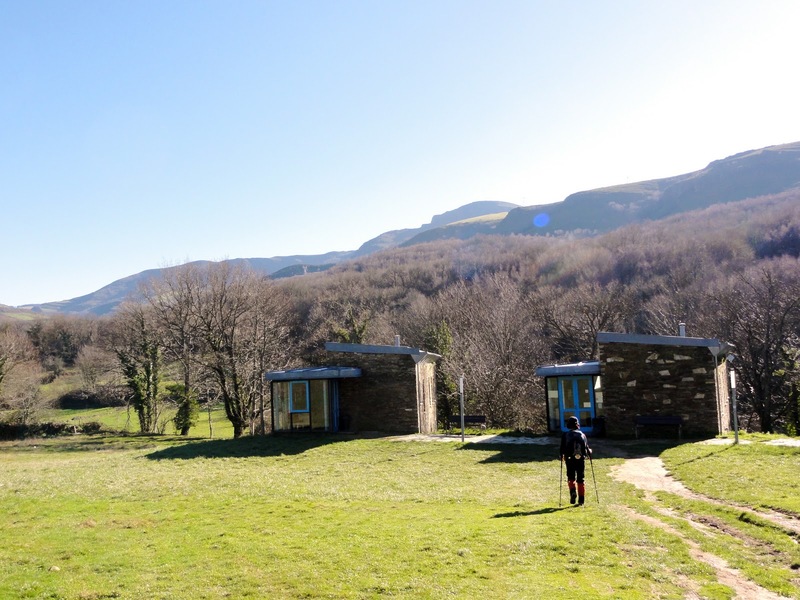 J and I started walking our Camino from St. Jean Pied de Port on December 15, 2010. This posting provides our daily progress, and accommodations through to Muxia which we reached on January 28, 2011. Comments on albergues are personal observations and should simply be regarded as such. Numbered days are days actually walked and do not include lay days (we took two of those in Leon). The numbers following the numbered days reflect the kilometers and miles walked for that day, and the miles walked that day adjusted for climbing (using the John Brierley formula). So each is described according to the format in bold below. Day 0 was our arrival day in St. Jean (no walking). Day 1 is our first day walking the Camino. Day 0 / Dec. 14 / St. Jean / 0 / 0 / 0 / Alberge de Pelerin / Municipal albergue located just a couple blocks from the pilgrim office. Jeanine, an elderly, and very kind, third generation hospitalera waited on us! Small but clean. Simple breakfast (coffee, tea, toast), donativo. Well heated. Day 1 / Dec. 15 / Valcarlos / 12.6 / 7.9 / 10 / Luzaideko Aterpea / Municipal albergue, located right at the end of a steep (50 ft?) concrete paved uphill section of the Camino path at the entrance of town. Small, clean, has a full kitchen and dining room, no washer&dryer (W&D). Well heated. Day 2 / Dec. 16 / Roncesvalles / 11.8 / 7.4 / 9.4 / Alberuge Collegiate Church / Very small town. In the winter they use a small section of the albergue on the ground floor as this is a huge facility. Relatively warm. W&D. No kitchen or common area. Small personal light came in handy as the access hallways were poorly lit. The only place to eat and get warm, when we were there, was the restaurant (also has hostal La Posada but closed for winter) just downhill from the seminary grounds. Loved their fireplace! Restaurant has internet. Day 3 / Dec. 17 / Zubiri / 22.2 / 13.9/ 14.5 / Pension Usoa (628-05-80-48; pensionusoa@hotmail.com) / Very nice 3 bdr & 2 bath apartment, has kitchen, dining, living room. One bathroom has bathtub! W/D, well heated. You can prepare your meals here. Internet. Day 4 / Dec. 18 / Cizur Menor / 27 / 16.9 / 18.4 / Roncal / Private albergue. Located just up and to the right from the crossroad as you enter the town. Relatively warm. Clean. Kitchen & Dining Rms. W&D in separate building. We were in winter quarters so only one shower & toilet. Internet. Day 5 / Dec. 19 / Puente la Reina / 19.6 / 12.2 / 13.3 / Padres Reparadores / Seminary run albergue. Poorly heated. Kitchen & Dining Rms. W&D. Nice and clean but cold. Day 6 / Dec. 20 / Estella / 21.1 / 13.1 / 14.1 / Iglesia Parroquial de St Miguel Arcangel / Parish run albergue. Hospitalera prepared dinner. You may contribute wine or bread. Clean and well heated. W&D. Separate shower & toilets for men & women. Donativo. Nice and welcoming. Internet in parish community center next to church. Day 7 / Dec. 21 / Los Arcos / 21.7 / 13.5 / 14.7 / Casa Alberdi / Private albergue. Poorly heated. Everything in the facility seemed old and unclean. Kitchen & Dining rooms in separate building but they were unheated (very cold) Laundry done by the owner at fee (but make sure your clothes are dry). Internet. 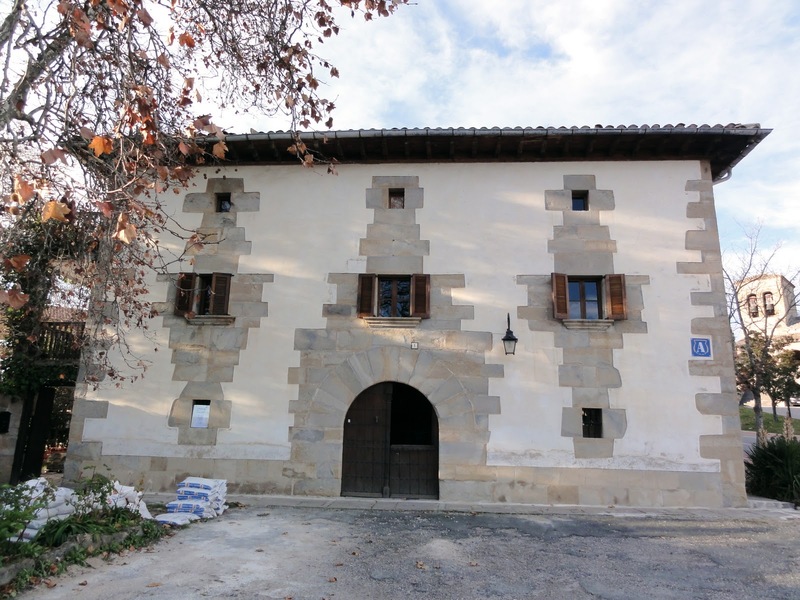 Day 8 / Dec. 22 / Logrono / 27.8 / 17.3 / 18.3 / Puerta del Revellin / Private albergue, located in the middle of the new town (opposite direction from municipal albergue in old town) and in a large apartment complex. New, very clean, and well heated. Laundry done by the owner at fee. No kitchen but small common area. Day 9 / Dec. 23 / Najera / 29.4 / 18.3 / 19.3 / Municipal / Old but well kept. Donativo. Operated by volunteer hospitaleros who are eager to help you. Laundry done by the hospitalero at fee. Kitchen & Dining room. Internet. Close to the old town. Day 10 / Dec. 24 / Santo Domingo de la Calzada / 21 / 13 / 14 / Casa del Santo / Association run albergue in the middle of town. Donativo. Kitchen & dining room. No W&D. Well heated. Albergue located 3 flights up the stairs. There is a new section but that was closed for the winter. We spent our Christmas Eve with 6 other pilgrims. 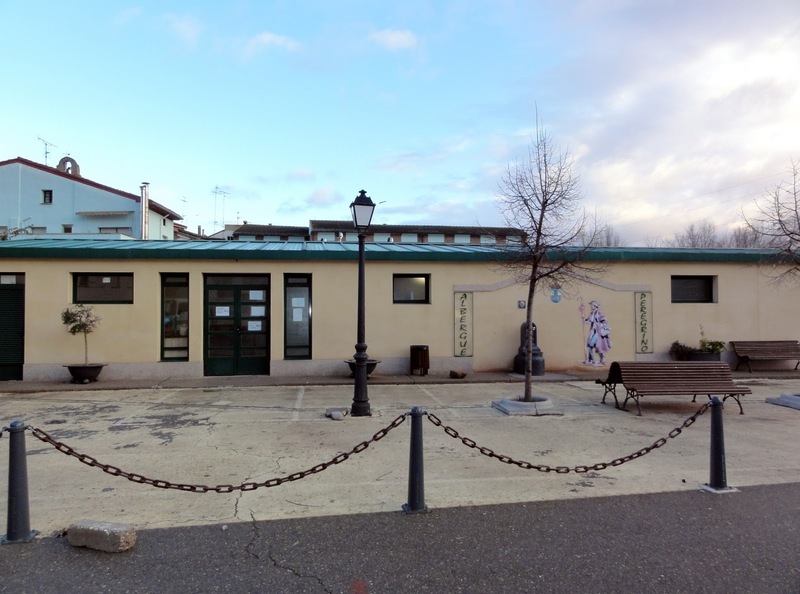 Day 11 / Dec. 25 / Belorado / 23.9 / 14.9 / 16 / Pension Toni / Small rooms but clean and well heated. Laundry done by the owner at fee. Day 12 / Dec. 26 / Villafranca Montes de Oca / 11.9 / 7.4 / 8.1 / Municipal / Clean. Relatively warm. Kitchen & Dining rooms. No W&D but extensive washing area. Internet (it wasn’t working). Day 13 / Dec. 27 / Atapuerca / 18.4 / 11.5 / 12.3 / Papasol / Small pension & restaurant, bar. Relatively warm. No W&D. The entire town was closed so our only option was to stay and eat here. Not bad. 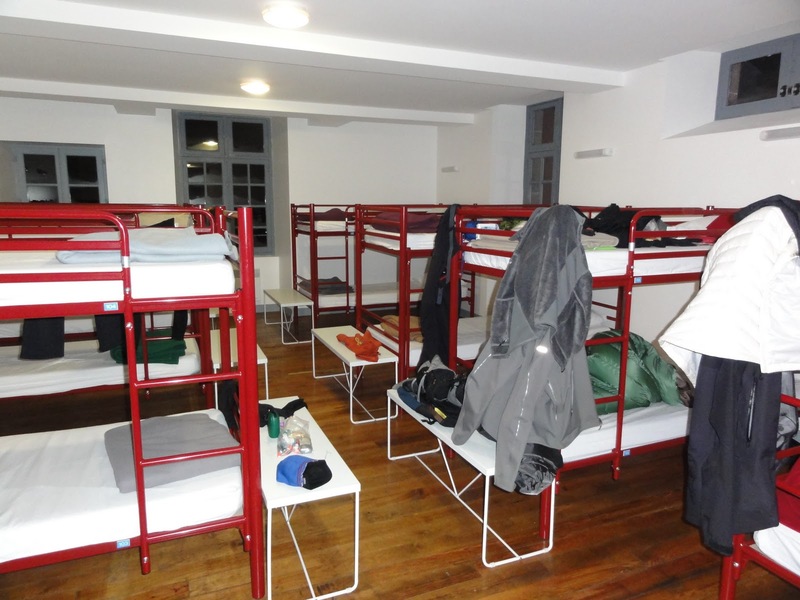 Day 14 / Dec. 28 / Burgos / 18.2 / 11.4 / 12 / La Casa del Cubo / Association (Amigos del Camino de Santiago) run, newly remodeled huge albergue. Very modern, clean, private lighting and plug, well heated, walls between bunk beds for privacy, W&D, internet. Kitchen, Dining and common areas. One of the nicest on the Camino. Day 15 / Dec. 29 / Hornillos del Camino / 20.5 / 12.7 / 13.3 / Municipal / Small albergue next to church. Some remodeling done in the shower & toilets. Kitchen & Dining room. No W&D. The only heat was a fireplace in the kitchen which we weren’t allowed to touch until hospitalera’s husband, who happens to be a head administrator of the town, awoke from his siesta (while we froze). They also own a bar which was closed but she opened it so we could purchase some food and wine. The fire was lit around 7 p.m. Thank God! But, alas, it went out long before we awoke the next morning. It was close to 50 F when we woke up. 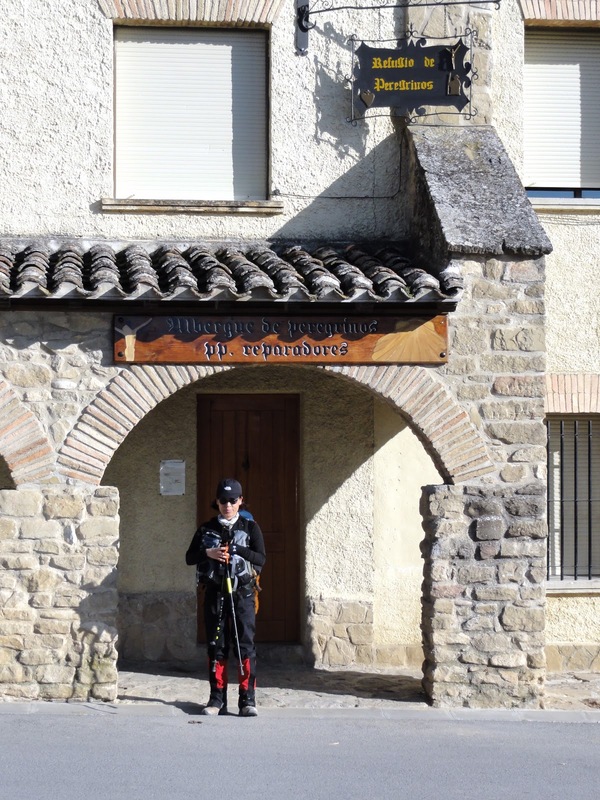 Day 16 / Dec. 30 / Castrojeriz / 21.2 / 13.2 / 14 / San Esteban / Municipal albergue, located on the highest point of the town. Donativo. Nice view. Run by township volunteers, usually one of the local shop or restaurant owners. Very clean, relatively warm, small kitchen & dining area, no W&D. Internet. 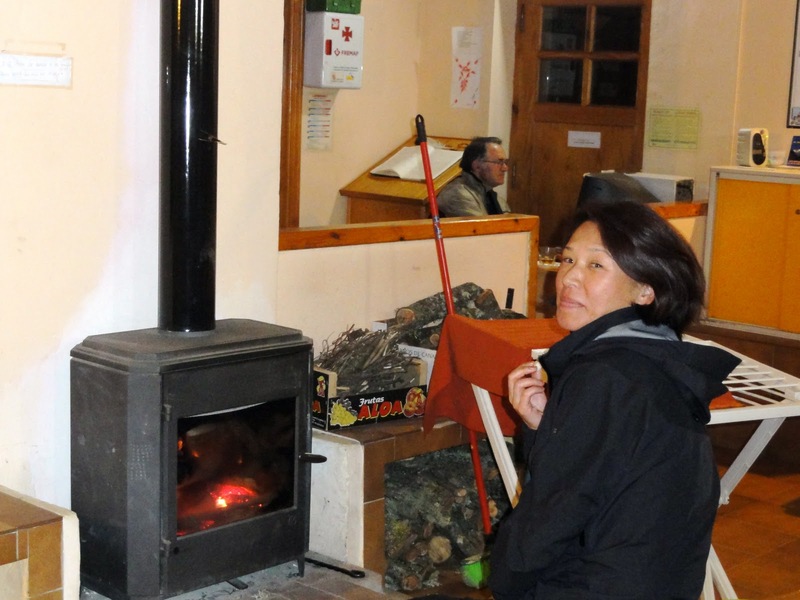 Day 17 / Dec. 31 / Fromista / 25.5/ 15.8 / 16.6 / Hostal Camino de Santiago / Located near church, small but clean and well heated. Include self-service breakfast (coffee, tea, toast) in the dining room. No W&D. Day 18 / Jan. 1 / Carrion de los Condes / 20.1 / 12.5 / 12.7 / Espiritu Santo / Convent run albergue located downtown. Very clean and relatively warm. Small kitchen & dining room, separate shower & toilets for men & women, donativo internet. Nuns have to open the door each time you want to go out and when you return. Day 19 / Jan. 2 / Moratinos / 30.1 / 18.8 / 19 / Tiera de Campos or better known as Peaceable Kingdom (34-979-061-016, rebrites@yahoo.com) / Private home modified to serve a few and lucky pilgrims at a time. Owned by expat-American and Irish journalists (Rebekah and Patrick). Very hospitable, clean, warm. Lodging, W&D, and dinner are all donativo. Contact them in advance to check availability. Day 20 / Jan. 3 / El Burgo Ranero / 23.6 / 14.8 / 14.8 / Domenico Laffi / Municipal, run by very friendly hospitalero. Small and very clean but no heat other than fireplace in the dining room. But our conversations with the hospitalero via my iPhone based Google Translator made for a memorable evening. Has a very clean kitchen & dining room. Internet. Day 21 / Jan. 4 / Viliarente / 25.8 / 16.2 / 16.6 / Hostal La Montana / Located in the middle of town by the main road, if you managed to get there without getting hit by cars when you cross the very narrow bridge into the town! Rooms located upstairs of the bar & restaurant. No W&D. 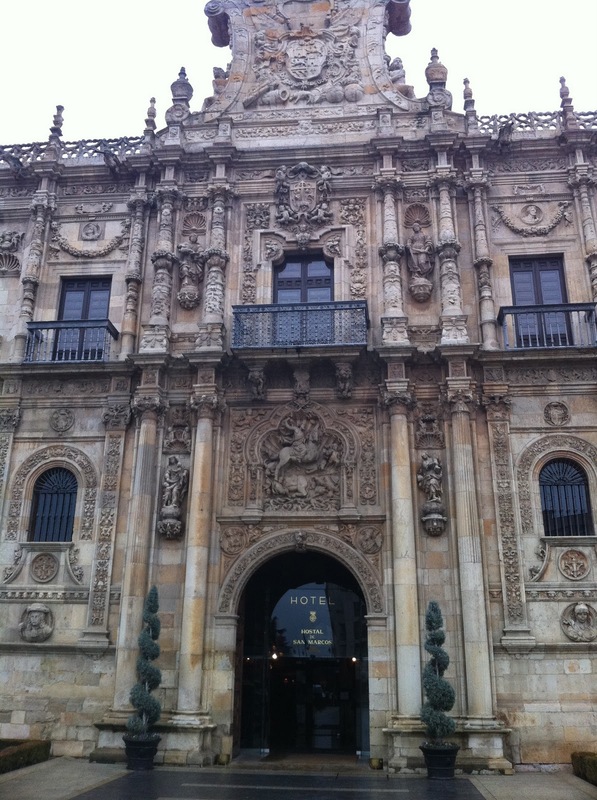 Day 22 / Jan. 5 / Leon / 15.9 / 10 / 10.5 / Parador Hostal De San Marcos / Oh, you must try it yourself. We stayed two extra nights for my upcoming 50th birthday and to let my sore ankle rest. Day 23 / Jan. 8 / San Martin / 27.5 / 17.2 / 18 / Albergue Ana / Private albergue & restaurant and bar on the main road. 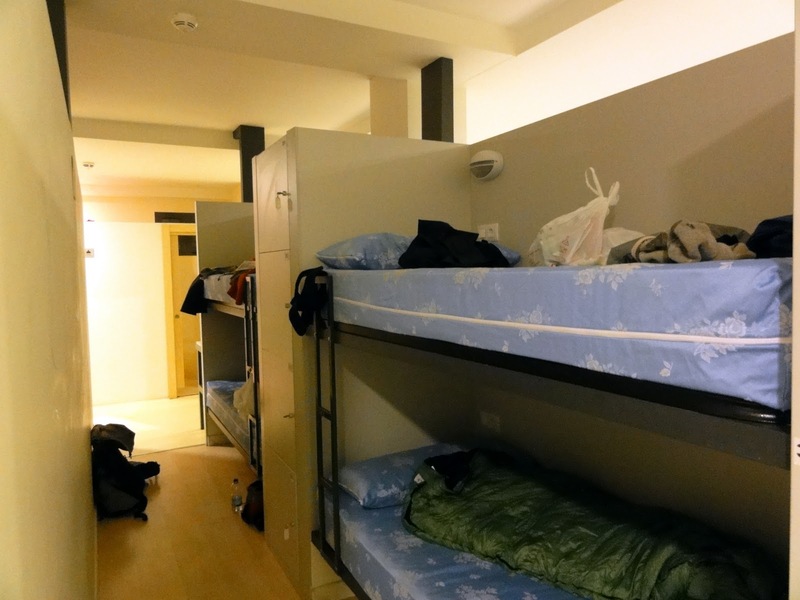 They told us very frankly that there is no heat in the dormitory but they will turn on heat for private rooms. We paid for a private room but I went to bed, fully dressed with a hat! No W&D. Internet. Day 24 / Jan. 9 / Astorga / 25.7 / 16 / 17 / Siervas de Maria / Association run albergue located in the Plaza San Francisco. Donativo. Very clean, modern, kitchen, dining, deck. Hospitalero does laundry at fee and he was eager to help. In fact, he gave us information about which albergue is open for our next three destinations. Internet. Day 25 / Jan. 10 / Foncebadon / 27.2 / 17 / 18.9 / Monte Irago / Association run albergue in the semi-ruined town. Optional dinner & breakfast at fee. Relatively warm. Hospitaleros are very friendly. Lobby area serves as dining and common area with fireplace (which was a saving grace!). No W&D but you can practice yoga the next morning with Filipe, the hospitalero. Be sure to eat before you leave for the long and arduous descent to Ponferrada. On a side note, you can stay and eat at Rabanal del Camino, a town 6 Km before Foncebadon. Also, on your way to Ponferrada, be sure to stop at what looks like a hut in Manjarin. That is the entire town! You will meet a group of habitants with Knights Templar costumes who love to serve you. I wouldn’t eat, drink, or stay there (it’s pretty rough). But get a stamp on your credential for your future trip down memory lane. 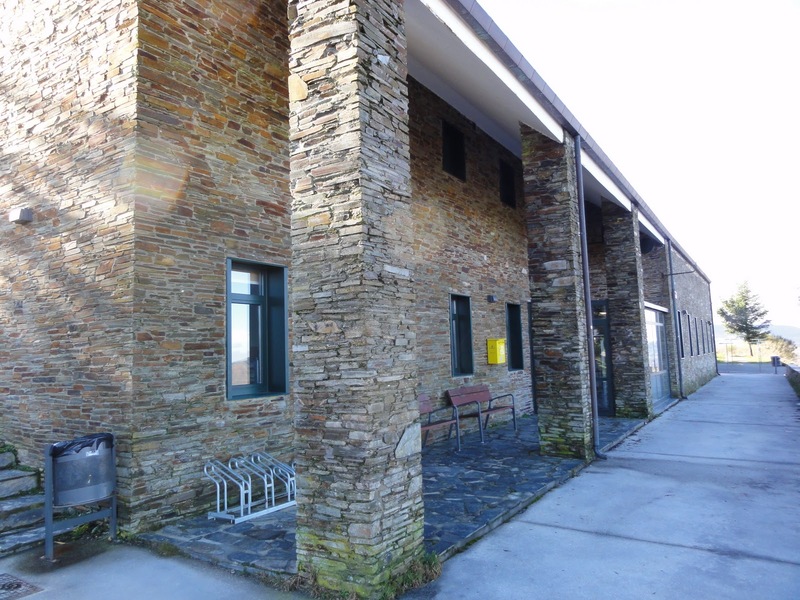 Day 26 / Jan. 11 / Ponferrada / 26 / 16.25 / 18.75 / San Nicolas De Flue / Municipal albergue at donativo. Clean and well kept with beautiful chapel across the court yard. I was delighted to meet the same hospitalero whom we had pleasure meeting in Najera. Hospitalero does laundry at fee. He gave us a private room! Well, a room with two bunk beds but just us…it is as private as you can get. Day 27 / Jan. 12 / Villafranca del Bierzo / 26 / 16.3 / 17 / Parador / We were going to stay at private albergue called Ave Fenix since the municipal albergue was closed. But we were struck by the funkiness of the place and opted to move on. There are many pensions and hostals in town but most of them, if not all, were closed. So, we went to the Parador, a new modern business hotel. Gosh, it was a very difficult choice to make…. Day 28 / Jan. 13 / Ruitelan / 17.2 / 10.8 / 13 / Pequeno Potala / Municipal, optional dinner & breakfast at fee. Hospitalero does laundry at fee. Relatively clean & warm. 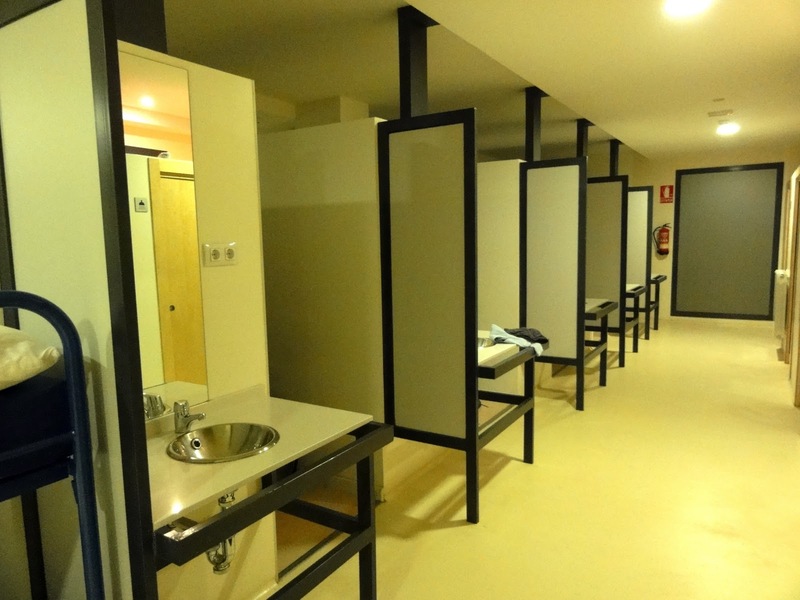 Day 29 / Jan. 14 / O’Cebreiro / 9.5 / 6 / 7 / Xunta* / Modern, clean, warm, separate shower & toilets for men & women. W&D. Great view! 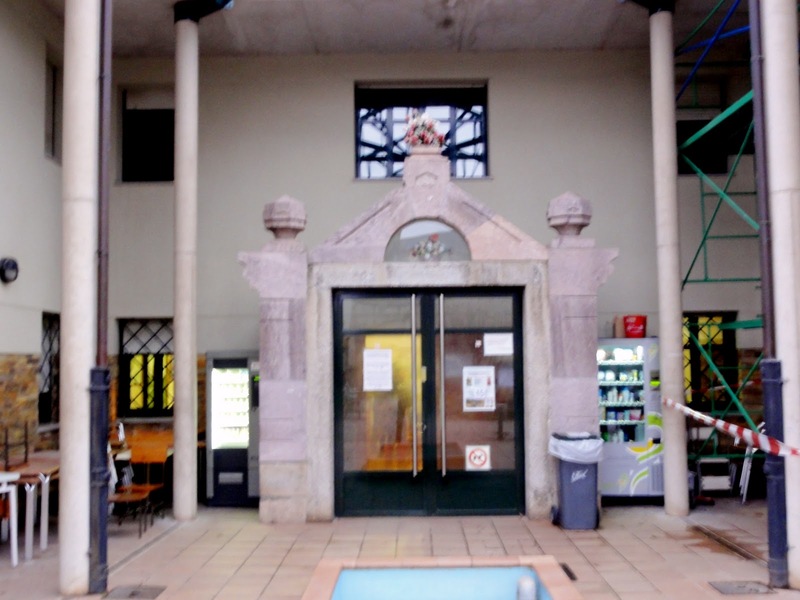 *Municipal albergues in Galicia are Xunta, regional government owned & operated. Most of them are modern, clean and very well heated. Most of them have kitchen & dining but with very limited cooking wears. None of the ones we stayed at had Internet. 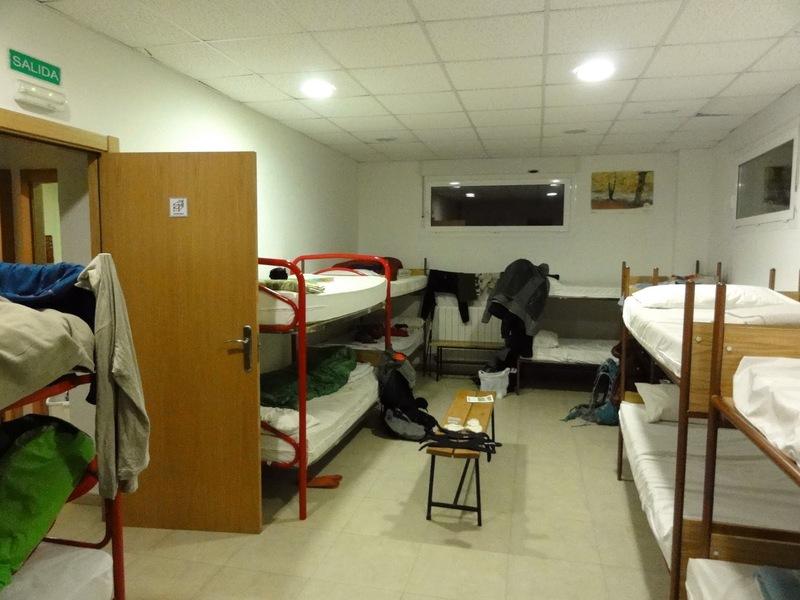 Day 30 / Jan. 15 / Triacastela / 20.7 / 12.9 / 13.5 / Xunta / We had a room with two bunk beds, almost private. 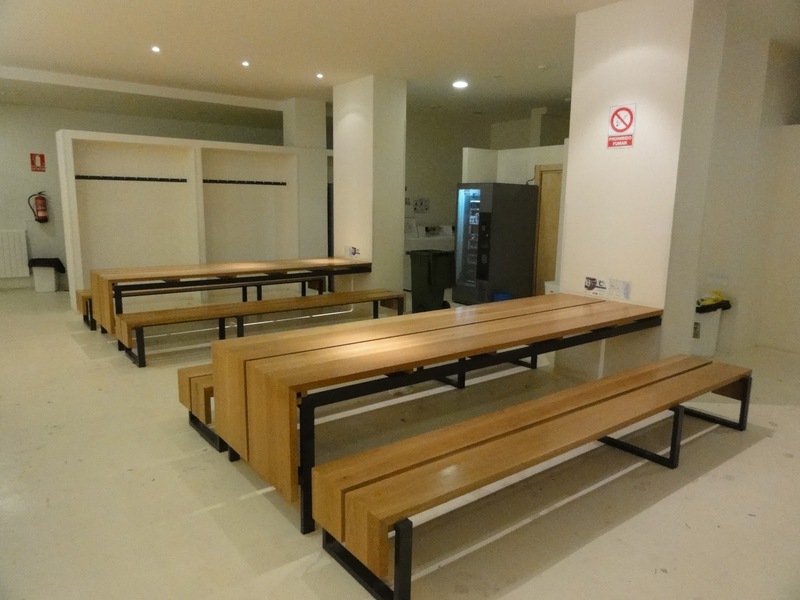 No common room, kitchen, dining, W&D in this facility. You will need ear plugs if you want to sleep as all doors are swinging doors without latches and as there is no common room people converse in the hallways. Day 31 / Jan. 16 / Sarria / 26 / 16.25 / 17 / Xunta / Located in the middle of town. Somewhat small but well maintained. Well heated. Women’s showers & toilets are located on the 3rd floor. If you are going to stay at this albergue (as there are many private albergues, pensions and hostals in town) plan to arrive early as it fills up rather early. Day 32 / Jan. 17 / Portomarin / 23 / 14.4 / 15.4 / Albergue Ultreia / Pension style private albergue, clean, kitchen & dinning room. Options for dormitory or private rooms. Owner does laundry or prepare dinner at fee. We opted to stay here for quietude. There are many private albergues, pensions & hostals by the lake and with great views. They were all closed for the winter. Day 33 / Jan. 18 / Palas de Rei / 26.1 / 16.2 / 17.6 / Xunta / Somewhat neglected but opted to stay for its convenient location. Only two shower stalls & toilets for the dormitory where we slept and the shower stalls did not have doors or curtains so some negotiation was necessary with fellow pilgrims to avoid unwanted exposure. It worked out fine. The building has more dormitories but only one was open due to small number of pilgrims in the winter. 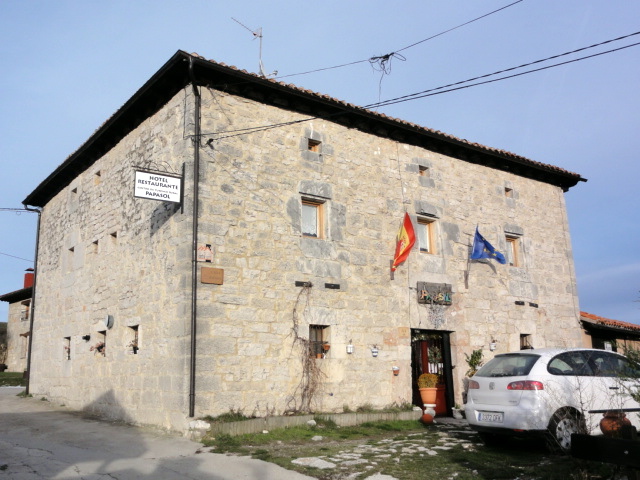 There is another Xunta albergue at the entrance of town which is relatively new and larger than the one where we stayed. 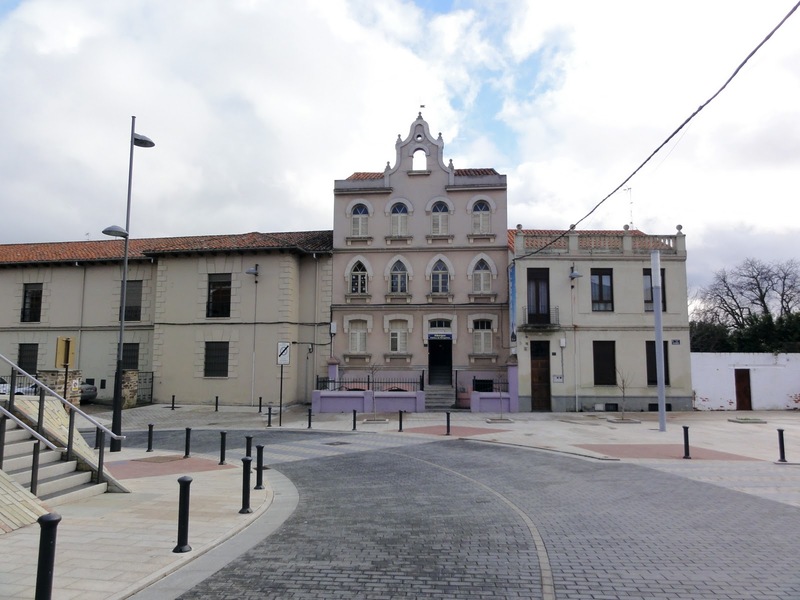 Day 34 / Jan. 19 / Arzua / 26.4 / 16.4/ 17 / Xunta / Located just block off of the main street, modern, clean and warm. Many restaurants and bars on the main street have Internet. Day 35 / Jan. 20 / Arca do Pino / 22.2 / 13.8 / 14.3 / Xunta / Follow the “albergues” sign once you reached the main road. Otherwise you will loop around this town in the woods! We did… Xunta albergue is located in the entrance of the town, on your left on the down slope just off the main road. An old school building renovated into an albergue, clean, warm. Day 36 / Jan. 21 / Santiago / 20.1 / 12.8 / 13.2 / Pension Badalada (981-572-618; info@badalada.es; http://www.badalada.es) / Many pilgrims stay at Xunta albergue at Monte del Gozo (about 5 Km before Santiago Cathedral) which is a huge facility where you can stay up to 4 days with credentials. We opted to go to Santiago and stayed at Badalada for 3 days. Small inn just behind the cathedral. Very hospitable, reasonably priced, clean and warm. No W&D. They can also receive packages on your behalf at fee (around $25.00/month) if you have reservation. The owner, Manuel speaks perfect English. Day 37 / Jan. 24 / Negreira / 22.4 / 13.9 / 15.9 / Xunta / Located 1 Km outside of town, slightly neglected but warm and even the kitchen has array of utensils. If you would like to shop, drink or eat do them before reaching the albergue. Otherwise you will have to walk back 1 Km into the town. Day 38 / Jan. 25 / Olveiroa / 33.1 / 20.5 / 22.2 / Casa Loncho / New pension located just off the main road as you enter this small town (Xunta albergue is located two blocks behind this facility. We opted to stay at this place as the albergue seems to have a separate building for dormitory away from showers and toilets). Very hospitable and the room was relatively warm. Dinner & breakfast offered at fee. 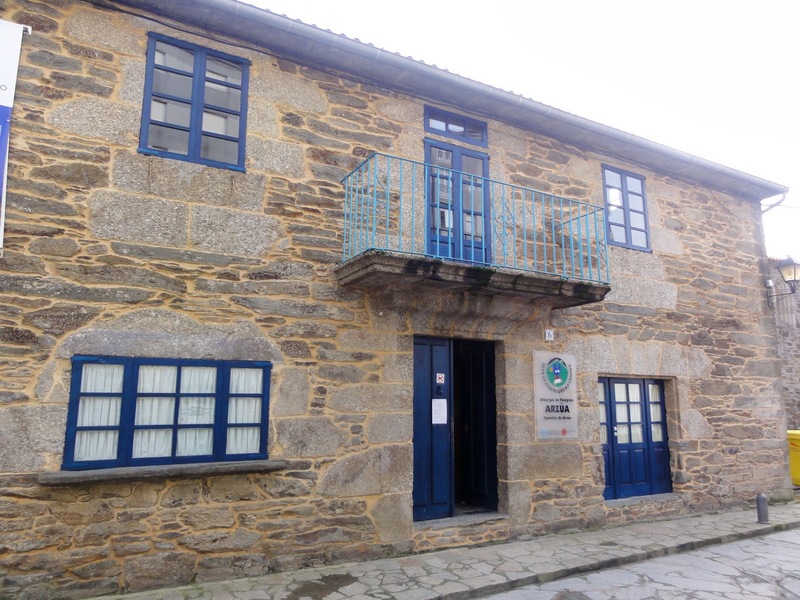 Day 39 / Jan. 26 / Cee / 18 / 11.25 / 12.25 / Camino das Estrelas / Private albergue owned by the hotel next door. Modern, clean and laundry is done by the hotel staff at fee. We were the only pilgrims staying in the dormitory and the heat was on just a few hours in the evening. The front door and even the lighting in the dormitory are controlled by the staff who are located in the hotel, next door. We had to call someone to turn off the light to go to bed and also the next morning to turn on the light so we could get ourselves ready to leave. Kind of weird. Day 40 / Jan. 27 / 18.2 / 11.4 / 12.4 / Finisterre (Faro) / Xunta / We checked in after visiting the light house. Small albergue located just off the harbor and next to the supermarket, clean, warm and very hospitable place. If you plan to return to Santiago by bus the station is right front of the albergue. Day 41 / Jan. 28 / Muxia / 30 / 18.75 / 19.5 / Pension La Cruz / Pension, restaurant and bar. We opted to stay at this pension due to a fellow pilgrim we met earlier reported a possibility of bedbugs in Xunta albergue. Located just off the harbor on the main street, clean, warm and very hospitable. Dinner at fee. No W&D. You can use free Internet at Casa Cultura (stamp & certificate are issued there also). It also serves as a library/community center for locals. Fabulous blog. We found your blog and followed you early Jan. Super wrap-up. We walked Camino Frances Apr/May 09 from SJPDP to finisterre also. Blizzard crossing the Pyrenees. We're returning Apr to complete Chemin Le Puy from Moissac, Fr to SJPDP and on to Estella where we will be Hospitaleros at Albergue San Miguel from may15-31. Karen has a blog at http://www.hypingthecamino.blogspot.com She will continue with it when we arrive in Fr. Thanks again for a great blog. Thank you Dayton and Karen for your kind words. Robin and i might eventually be following in your footsteps as we decide which route to walk next. Good luck on your upcoming camino and thank you for volunteering as Hospitaleros at Albergue San Miguel, We had a wonderful stay there last December. The hospitality was both warming and nourishing. Have fun. We will follow your blog. We are from Vancouver, WA, which is 168 miles from Seattle. I knew there was a camino group up there but have never had an opportunity to attend one of their meetings. I also know their is a group trying to get off the ground in Portland which would be much closer to home. Hope all is well.